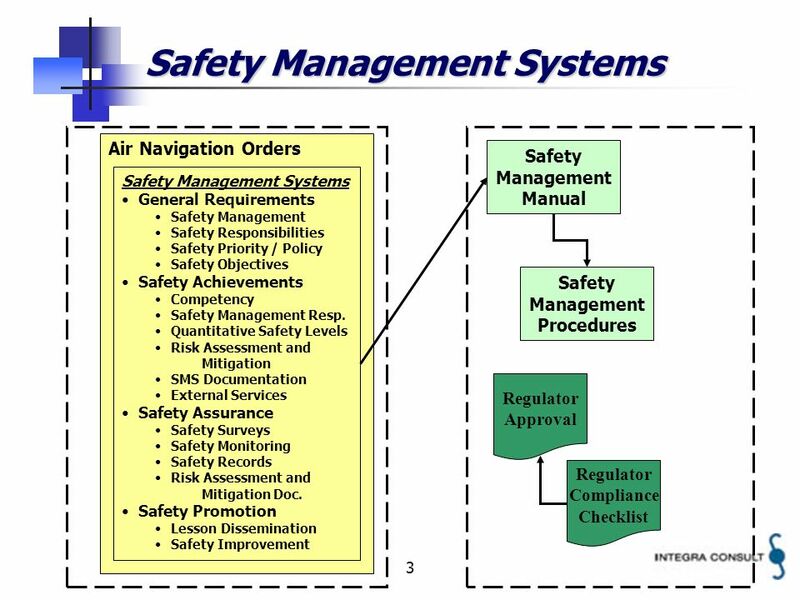 4 4 Safety Management Systems Air Navigation Orders Safety Management Systems General Requirements Safety Responsibilities Safety Achievements Safety Management Resp. 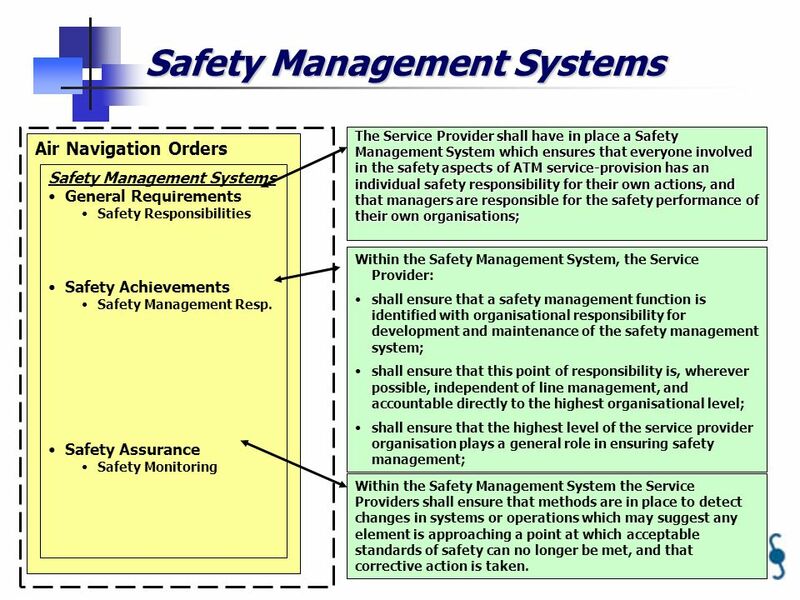 Safety Assurance Safety Monitoring Within the Safety Management System, the Service Provider: shall ensure that a safety management function is identified with organisational responsibility for development and maintenance of the safety management system; shall ensure that this point of responsibility is, wherever possible, independent of line management, and accountable directly to the highest organisational level; shall ensure that the highest level of the service provider organisation plays a general role in ensuring safety management; The Service Provider shall have in place a Safety Management System which ensures that everyone involved in the safety aspects of ATM service-provision has an individual safety responsibility for their own actions, and that managers are responsible for the safety performance of their own organisations; Within the Safety Management System the Service Providers shall ensure that methods are in place to detect changes in systems or operations which may suggest any element is approaching a point at which acceptable standards of safety can no longer be met, and that corrective action is taken. 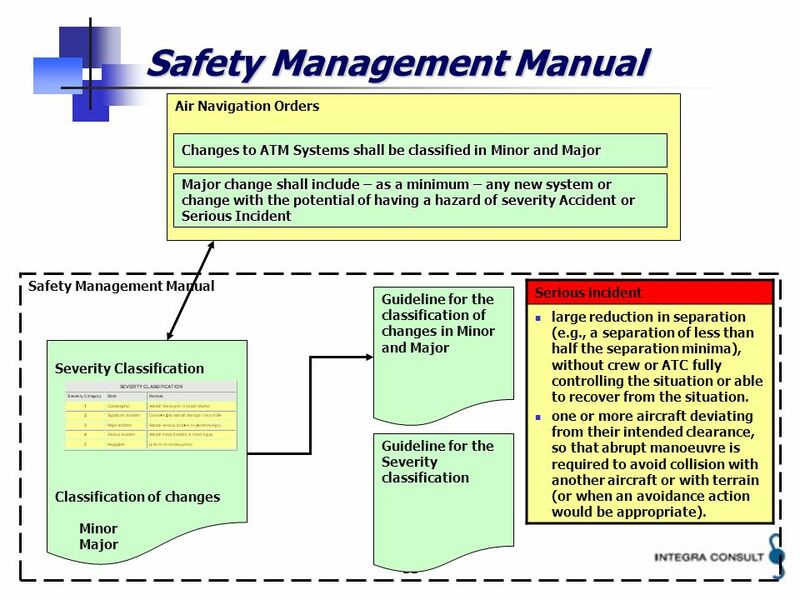 11 11 Safety Management Manual Air Navigation Orders Severity Classification Classification of changes Minor Major Safety Management Manual Major change shall include – as a minimum – any new system or change with the potential of having a hazard of severity Accident or Serious Incident Changes to ATM Systems shall be classified in Minor and Major Guideline for the classification of changes in Minor and Major Guideline for the Severity classification Serious incident large reduction in separation (e.g., a separation of less than half the separation minima), without crew or ATC fully controlling the situation or able to recover from the situation. 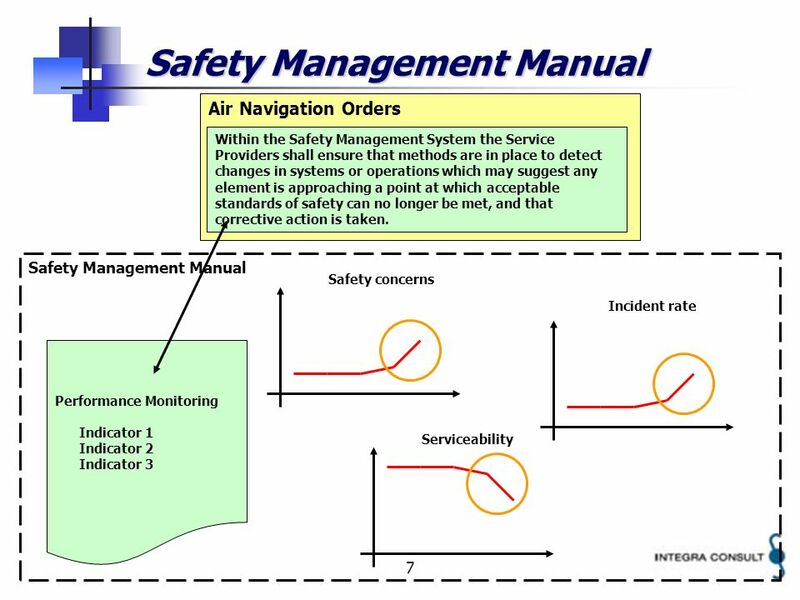 one or more aircraft deviating from their intended clearance, so that abrupt manoeuvre is required to avoid collision with another aircraft or with terrain (or when an avoidance action would be appropriate). 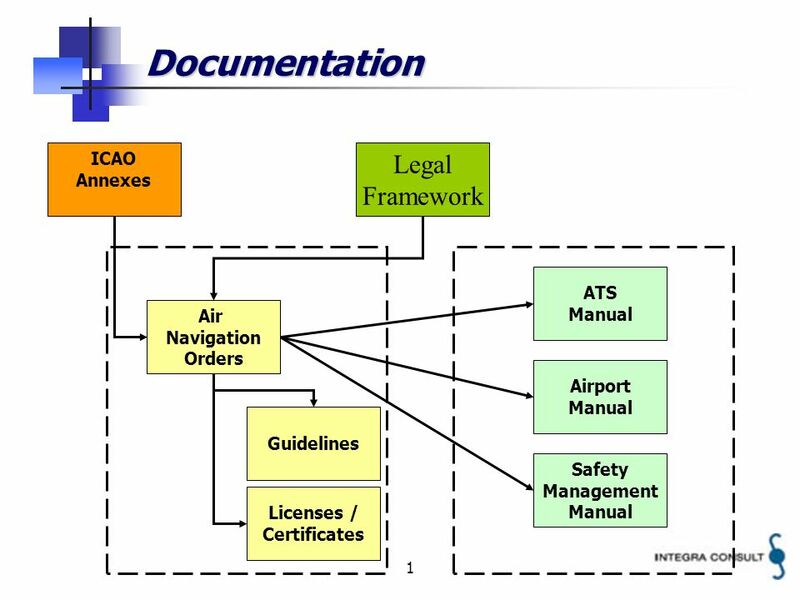 Download ppt "1 Documentation Legal Framework Air Navigation Orders Guidelines ATS Manual Airport Manual Safety Management Manual ICAO Annexes Licenses / Certificates." 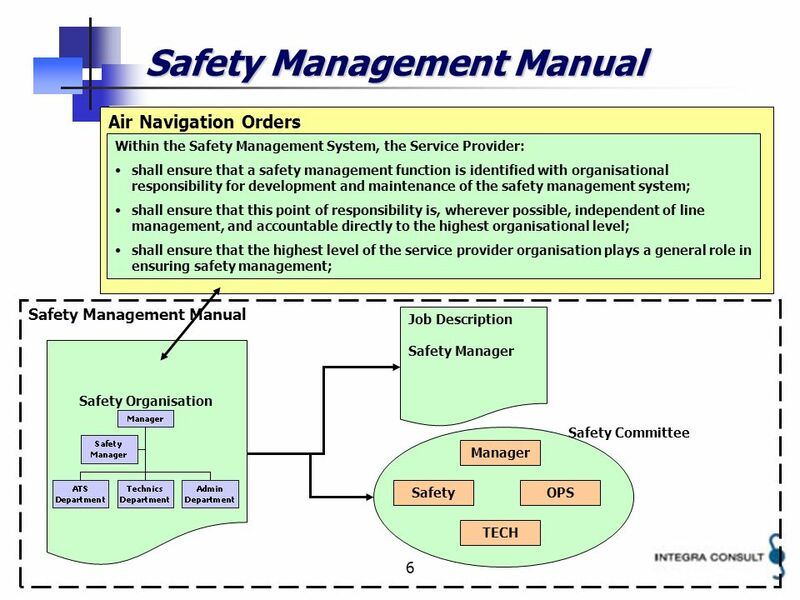 Module N° 5 – State ALoS. 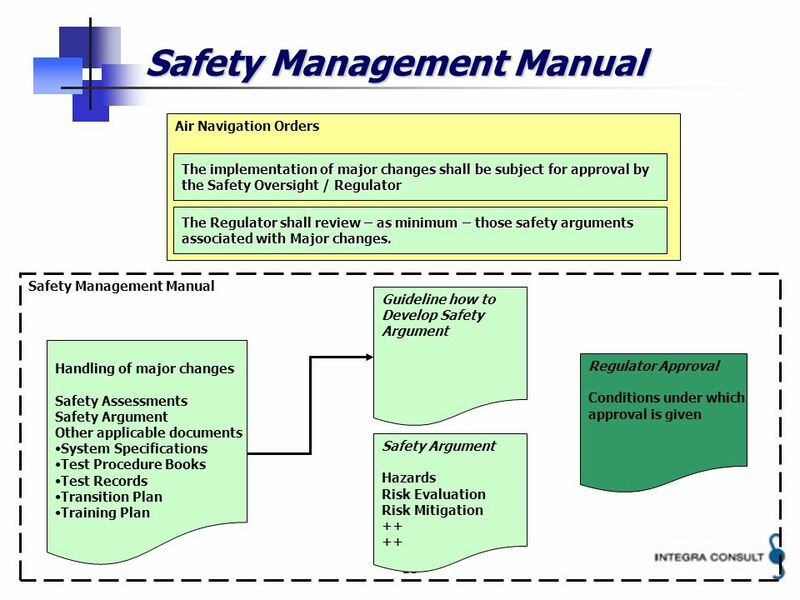 SSP – A structured approach Module 2 Basic safety management concepts Module 2 Basic safety management concepts Module 3 ICAO. 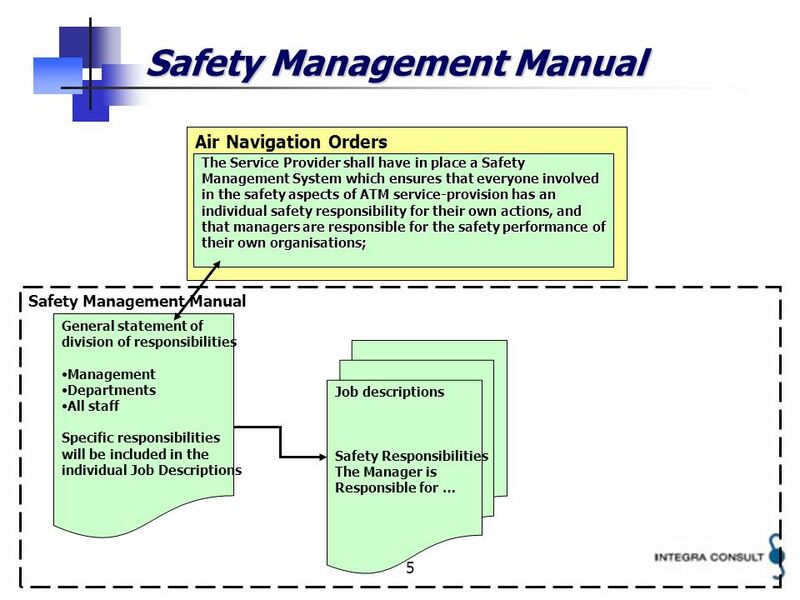 Module N° 6 – Prescription/Performance based environment. 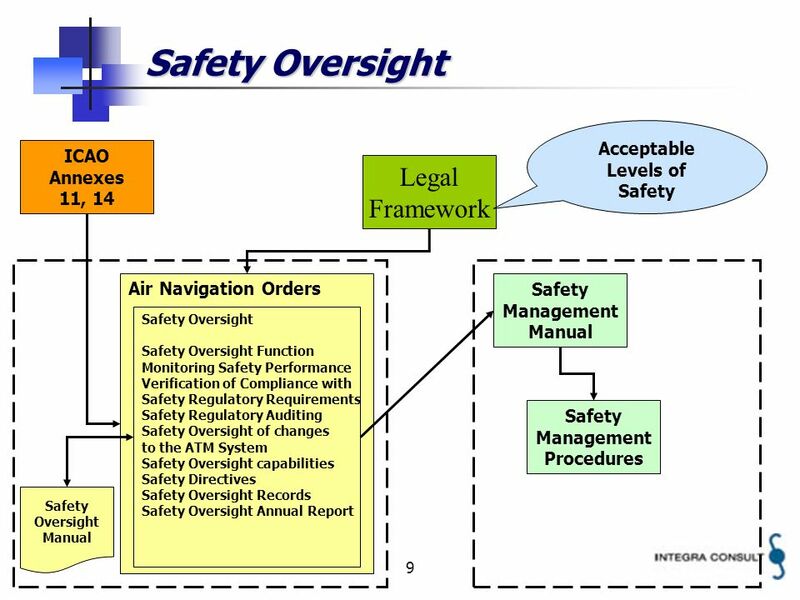 1 Acceptable Levels of Safety Severity Classification Likelihood Classification Risk Classification Scheme Safety Objective Classification Scheme Regulations. 1 Welcome Summary - First visit Delhi Integra A/S Independent consultancy company Headquarter located in Copenhagen, Denmark Working worldwide. 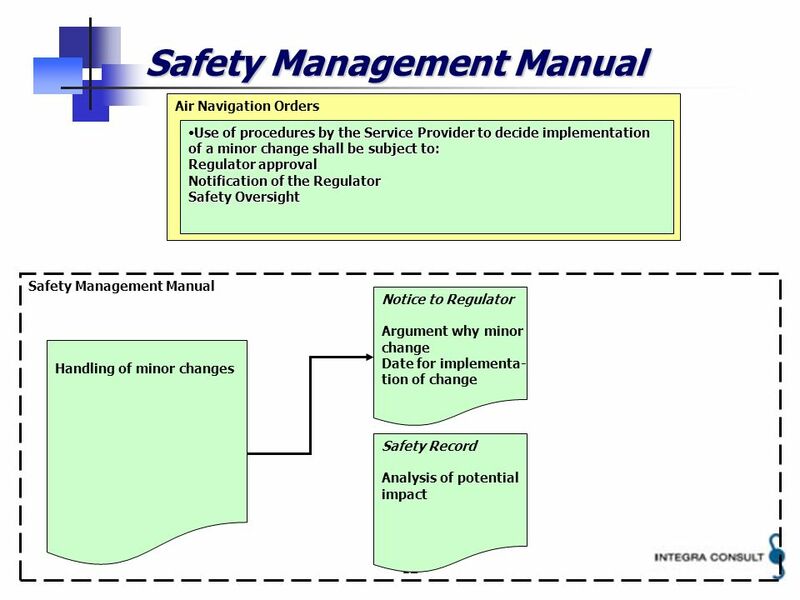 1 Safety Policy April Safety Policy National Level Regulator Service Provider Service Provider. 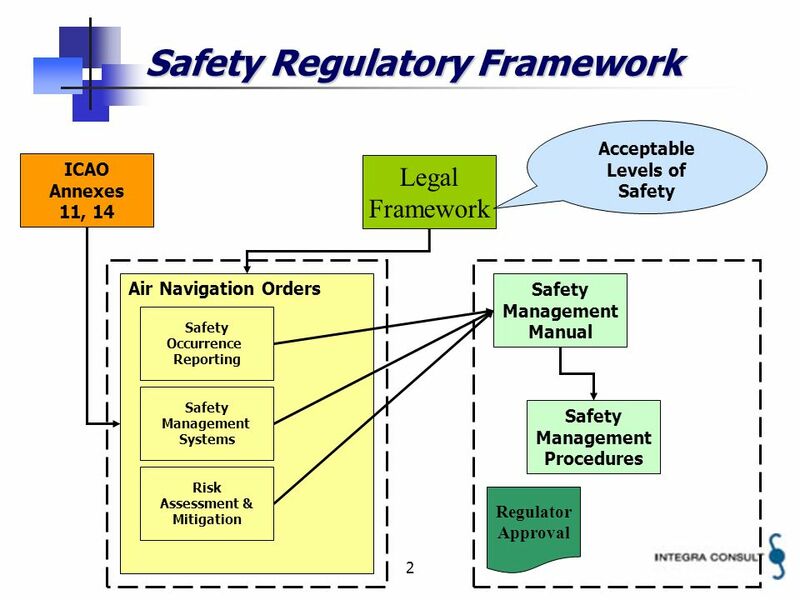 1 Reporting April Safety Policy Regulator Service Provider Service Provider Service Provider Regulator to established SRF to harmonize reporting. 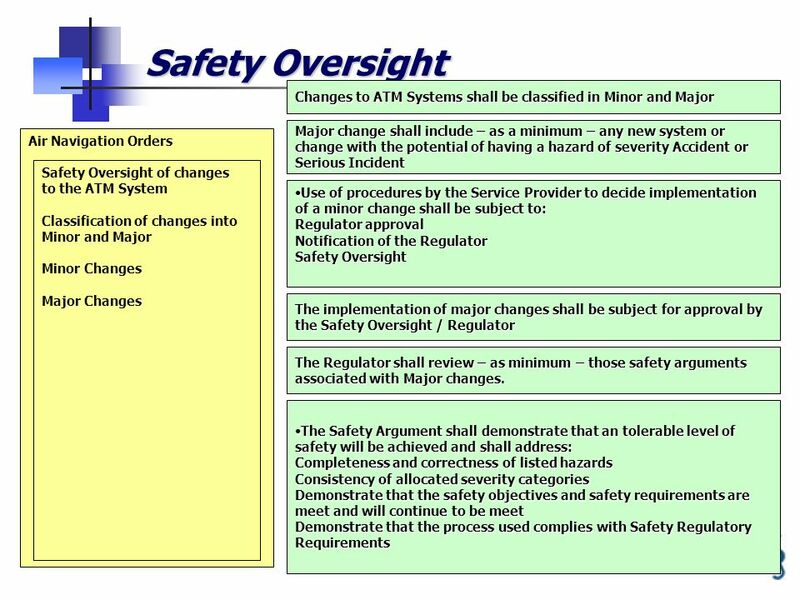 1 Establishment of Regulatory Framework April 2006. 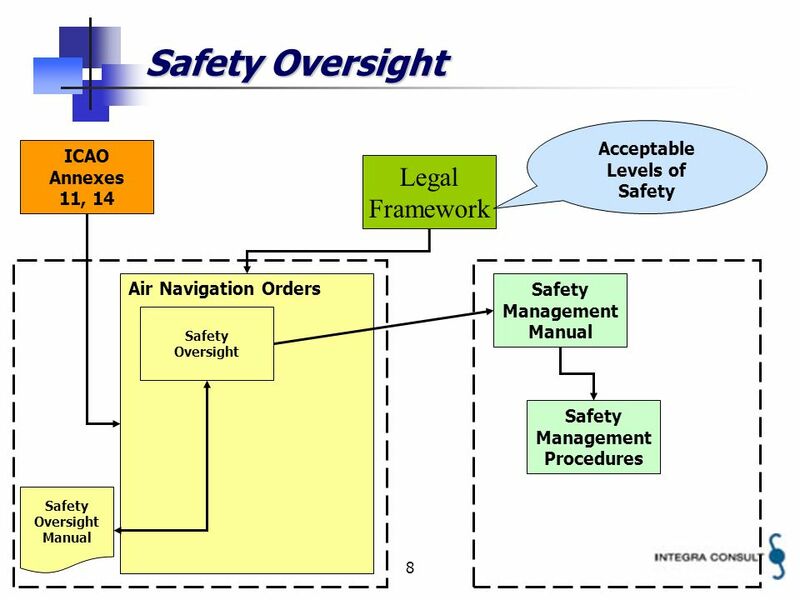 Integra Consult A/S Safety Assessment Karachi, January 2006.